The "Grande Terre" archipelago. The Grande Terre is the largest island of the New Caledonian group. It was named New Caledonia by Captain Cook who discovered it. They are many small islands around it. The main ones are the Beleps islands and Surprise reefs in the North and the Isle of Pines or Kunie in the South. This archipelago is the emerged part of an arc of complex alpine type of folded geological formations. East of Grande-Terre, the Loyalty islands archipelago with Ouvea, Lifou, Tiga, Maré islands, the Beautemps-Beaupré reefs in the North and the small island Walpole in the South. They are coral limestone islands built above collapsed volcanoes. In the East : the volcanic islands of Matthew and Hunter on the southern part of the New-Hebrides volcanic arc. In the West : the reefs and small islands of the Chesterfields plateau. 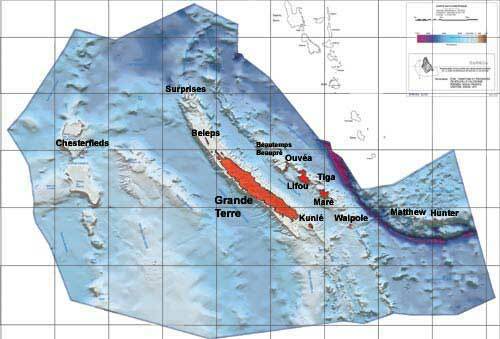 The Exclusive Economic Zone (EEZ) of New Caledonia contains these archipelagos. The map to the left shows these islands with the boundaries and seabed features of the EEZ. The various arcs are easy to distinguish. A very deep trench (more than km deep) separates the New-Hebrides arc which sits on a different tectonic plate(Pacific Plate).